View of Raphael Barontini's Idole déesse, 2017. Photo: Biennale Internationale de Casablanca. 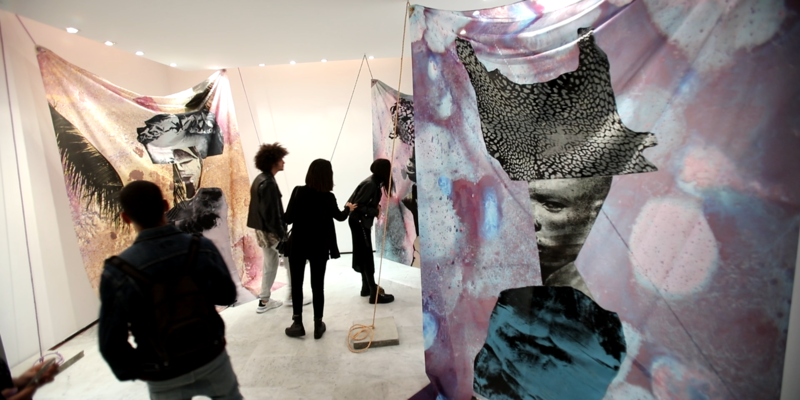 THE PLAN FOR THE FOURTH EDITION OF THE BIENNALE INTERNATIONALE DE CASABLANCA, held from late October to early December, was to raise the profile of the event in a manner befitting the economic and cultural significance of Morocco’s biggest city. In prior editions, initiated by the Moroccan photographer Mostafa Romli and run through a foundation called Maroc Premium, the biennial wasn’t really achieving that. Its quality was middling; it had neither the means nor the glitz to rival the Marrakech Biennial, which was founded in 2004 by the British entrepreneur Vanessa Branson. This year, however, the Marrakech event was cancelled, plagued by deficits. The Casablanca Biennale, meanwhile, brought on the London-based Cameroonian scholar and curator Christine Eyene as artistic director. She, in turn, attracted strong submissions around a theme, “Tales from water margins,” which alludes to Casablanca’s liminal positionon the Atlantic, at the edge of Africa and Europeand contemporary issues of power, migration, and exchange. Unfortunately, the logistics weren’t up to par. During the opening weekend, the biennial faced a full-fledged rebellion, with fifteen of the thirty-five participating artists signing a letter addressed to the organizers that enumerated poor communication, ultra-late travel bookings, missing per diems and uncovered costs, no installation assistance, and so on. Some had been urged, very late in the game, to scale down their works or swap in old ones. The biennial is privately funded, with no contribution from the city government, and apparently, a major sponsor had dropped outthough it disputed ever having made a commitment in the first place. This, in turn, explained a range of observable hiccups, from missing labels and wall texts to the fact that, on the evening of the opening event, the Villa des Arts exhibition venuea lovely 1934 all-white Art Deco structure in central Casablancawas cleared for two hours to make way for a philosophy conference that had been double-booked in the same location. When things resumed, artist Mehryl Levisse inserted into his costumed performance piece a “minute of silence for the artists of the biennial.” By this point, much of the audience had scattered. Two days later, I noticed a guerrilla installation in the Villa des Arts gallery: French artist Caroline Trucco had framed a letter to Romli complaining that her submission to the biennial was returned to her unopened, along with the original envelope with post-office stamps attesting. Despite the damageone headline in the Moroccan press called the biennial’s intended upscaling a “false new start,” another referred to it as a cafouillage, a big messthings stabilized, and the mood shifted to a kind of genial resignation, perhaps because of the nice weather and a swinging party at the home of collector and publisher Meryem Sebti, who runs the respected Moroccan art magazine Diptyk. Eyenewhom the artists, in their letter, made a point of lauding for her curatorial visionwas in a philosophical mood. She has signed on again as the biennial’s artistic director for the 2020 edition. View of Cristiano Berti's The Futile Cycles, 2018. Photo: Biennale Internationale de Casablanca. Indeed, the works Eyene assembled were serious and often exciting. The artist Shiraz Bayjoo, who is based in London and comes from Mauritius, filled a room with two video displays, archival photographs, and documents, all amounting to a multimedia history of his home country, a French and later British sugar-plantation colony, as well as a tribute to anti-imperial resistance, from seventeenth-century pirates to the twentieth century. His work formed an elegant symmetry with an installation by Yohann Quëland de Saint Pern, from another Indian Ocean island, the French territory of La Réunion. De Saint Pern set up vertical planks of driftwood rising from a long table and anchored to small rocks and tethered with string. This nautical material superimposed silhouettes onto two wall projections: one, a clear screen, producing the effect of a skyline, and the other, a loop of protest scenes from the Fees Must Fall university uprising in South Africa. Ibrahim Ahmed, an Egyptian American artist based in Cairo, showed one of the bricks he created out of strips of fabric from all over the Global South, a taste of his larger project of producing similar bricks––compacted and glazed to the point you could build with them––with artisans in his neighborhood. 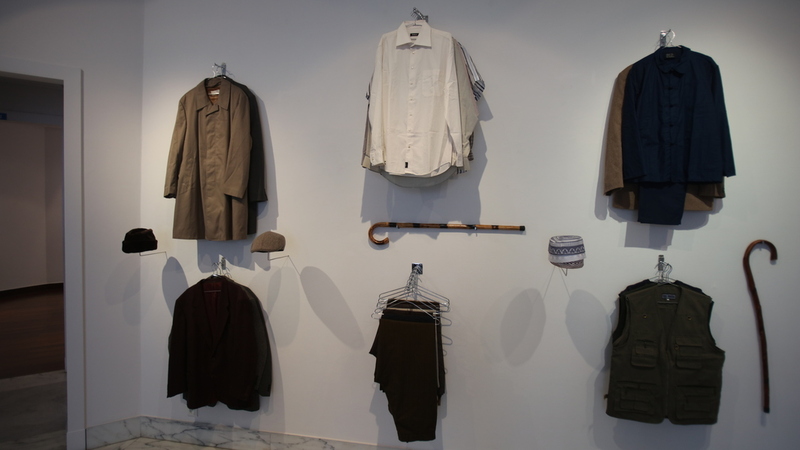 Les invisibles, an installation by the Algerian artist Oussama Tabti, was simple, lucid, and highly affecting: Wall-mounted hooks and racks were hung with shirts, jackets, caps, and canes typical of the first generation of North African men who emigrated in the 1960s to Europe, where their labor was wanted but where their humanity was diminished. Their dress expressed their slender means but also their insistence on dignity. 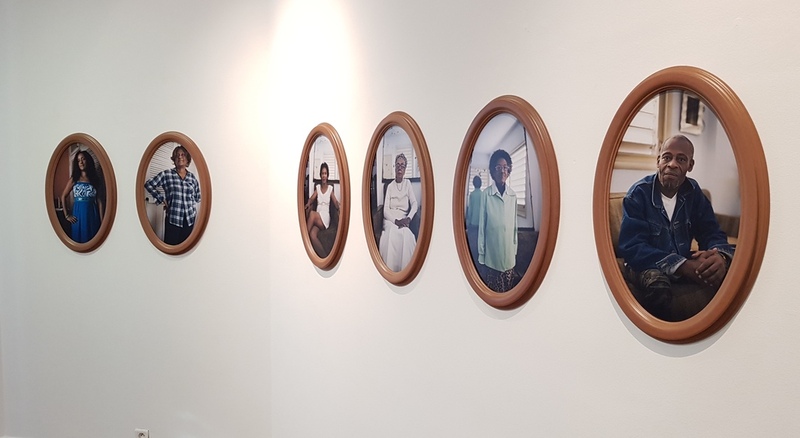 The Italian artist Cristiano Berti offered another kind of memory work: an ongoing family tree naming thirty descendants of enslaved workers on an Italian coffee plantation in nineteenth-century Cuba who carry his surname, Boggiano, paired with a series of photo portraits of the family members. Also notable was Bosphorus, a collaboration between visual artist Magda Stawarska-Beavan and sound artist Joshua Horsley, built around a two-channel video of crossings, in both directions, of the strait in Istanbul, which separates Europe and Asia. View of Oussama Tabti's Les Invisibles, 2018. Photo: Biennale Internationale de Casablanca. The biennial included exhibitions at several other spaces in the city. At the GVCC gallery, another elegant old building on Boulevard Moulay Rachid, the standout was Raphaël Barontini’s textile installation Odyssey, featuring large swaths of fabric hung like sails, dyed and impressed with print patterns and enlarged partial photographs of human figures, with each sheet becoming a kind of composite portrait. It was lyrical work and technically adept, and Barontini, who is concerned with Creole identitieshe is French with family roots in Italy, Réunion, and Guadeloupesidestepped the conceptual minefield that faces European artists working with black subjects. At the So Art gallery, the Tunisian artist Haythem Zakaria showed part of his photo- and video-based Interstices, which involves digitally altered black-and-white panoramas of desolate sites along North Africa’s coast. Héla Ammar, also from Tunisia, presented stunning photo portraits of bare-chested men, some marked with body art, each with his head wrapped and concealed with fabric. Next to these was another work by Ammar, this one compressed and lapidary: a projector running through a set of slides, each one blank save for a small line of text in English with a statement such as “Because it’s worth it, I take the chance” or “Because I’m already dead here.” Clearly, these are the words of migrants who risk their lives crossing the Mediterranean. The piece is titled Why do you ask? View of Thierry Geoffroy's Nous ne pouvons prédire le pouvoir des vagues, 2018. Photo: Biennale Internationale de Casablanca. In short, artistic substance was abundant; the challenge, the next time around, will be not only funding and logistics but also to connect the event to the city. Exhibitions were free of charge, and a number of Moroccan artists were featured (including the mixed-media artists Mo Baala, Fatima Mazmouz, and Saïd Raïs, and the photographers M’hammed Kilito and Yoriyas Yassine Alaoui), yet there was little sense of outreach to the broader public. Dynamic multiarts institutions such as the Studio des Arts Vivants, or L’Uzine, an arts hub in a former factory where the Casablanca art scene connects with the working-class communities of Aïn Sebaa and Hay Mohammedi, were not involved. In all, it felt like a small amount of preparation and partnerships could have delivered a substantial cultural payoff, despite limited means. Culture is at the heart of Morocco’s assertive deployment of soft power, alongside the strenuous political effort to portray the country as open, tolerant, and diverse. Whether the Marrakech Biennial will be revived is not clear; meanwhile, a potential heavyweight is taking shape in Rabat, with a first edition planned for spring/summer 2019, and with the power of the royal palace behind it. Perhaps that competition will goad Casablanca’s business barons, who are proud of their patronage of the arts, as well as city authorities and other players, to put forward an event that does justice to their city.